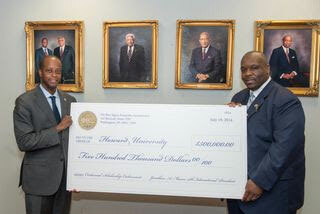 President of Phi Beta Sigma Jonathan A. Mason, Sr..
Late last month, Phi Sigma Beta Inc. International President Jonathan Mason presented the gift to newly appointed Howard University President Wayne A.I. Frederick. A week before the presentation, Phi Sigma Beta celebrated the centennial of its founding with a gala event in Washington, D.C. The community service organization currently boasts more than 150,000 members and chapters in every state.